Walnut is the wood of choice for many designers: its rich colour and defined grains bring a warm, natural aesthetic to modern kitchens. And it bridges the divide between traditional and contemporary, bringing an approachable, friendly vibe to the busiest room of the house. Whether used to frame a bank of cabinets, ground a countertop, or connect an open-concept kitchen with the rest of the house, wood is being used to great effect in houses of all sizes and styles. 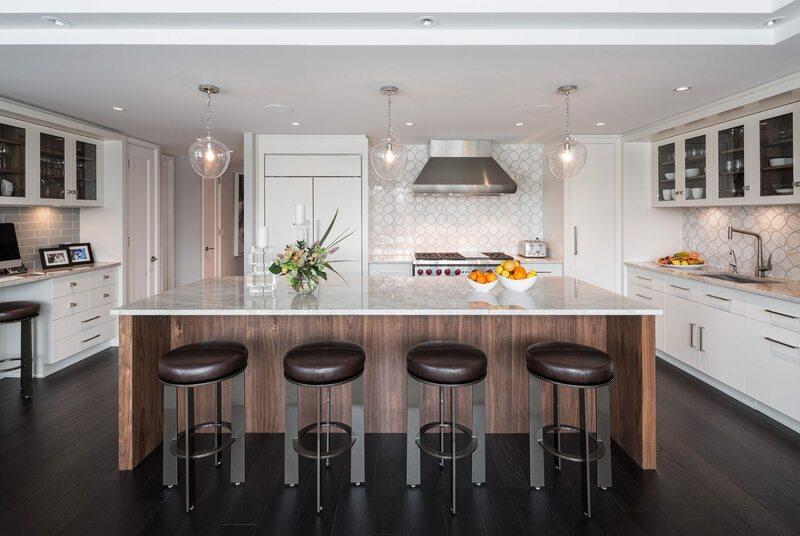 While white surfaces continue to be the starting point in kitchen design, wood — and walnut, in particular — is becoming a popular, efficient accent element. American walnut was used in this award-winning kitchen. Roca Homes worked with Dylan O’Keefe of O’Keefe Fiorenza Design Group, who used wood to frame the oven wall, which mirrors the waterfall legs of the island. 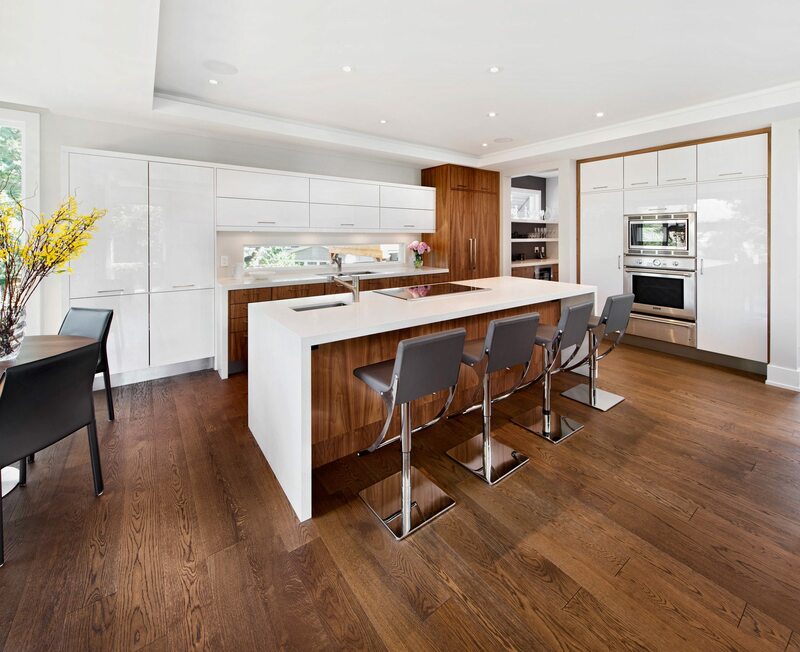 The larger appliances have been panelled in walnut veneer, and the flooring was chosen for its dark tone. The resulting effect is that the kitchen blends seamlessly into the rest of the house. The rich colour and defined grain of walnut complement this kitchen the way a piece of furniture adds colour to a white wall, notes Conrado Canolo of Christopher Simmonds Architect. 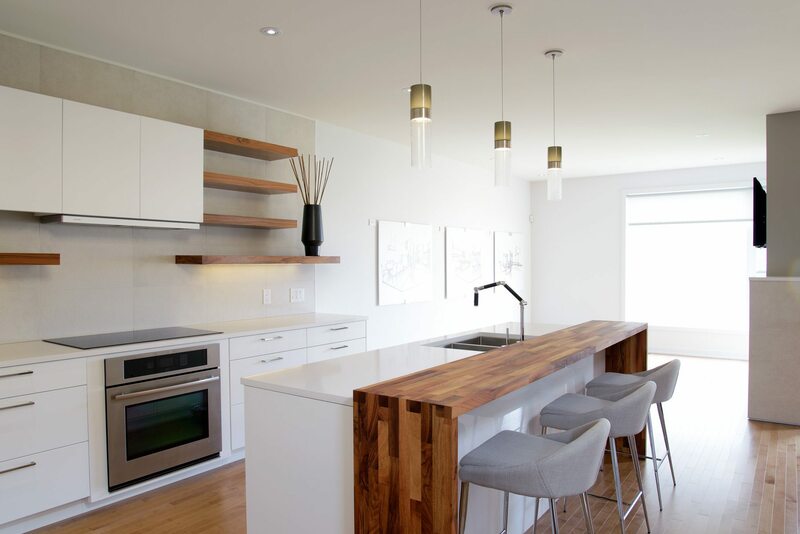 Meanwhile, the floating shelves and raised eat-in area, which were custom-made by Deslaurier Custom Cabinets for this HN Homes model kitchen, add warmth to a space that is otherwise mainly white. A marriage of traditional and contemporary was the goal in this Astro Design Centre project. Natural American walnut, with its depth and colour, was the go-to material, as it plays beautifully against subdued textures and tones. “I love the look of white dishes in front of a dark interior … Nothing is more decadent in design than using luxurious materials in discreet applications,” notes Astro’s Dean Large.